Well educated studio musicians with a high class vocalist in Larry King got together in this fabulous production from Mr Thompson. 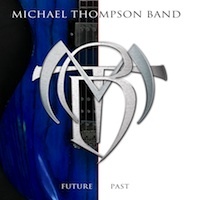 And the result is: Michael Thompson Band's album 'Future Past'. This is pure AOR / West coast rock with all the compulsory aspects that this genre requires: amazing vocals, rhythmic melodies and completely gorgeous instrumentalists and well written songs. The flawless production is overwhelming and even if I like much harder rock tunes, I can appreciate good musical craftsmanship, just as M.T.B offers on this piece of art. 'High Times' is a classic rock track with chic melodies, fresh guitar chords and great singing. Best song on the album is the rockier song 'Can't Be Right' with tougher choruses, stiffer guitars and a guitar solo which gave me Goosebumps of joy. Michael Thompson Band cruises nice and elegantly their way through the songs and leaves me with a desire for some harder tracks that should break the highly polished surface, which can be a little too cheerful. 'Future Past' is overall a mature AOR album for fans of the softer American melodic rock genre. On drums: Khari Parker and Alan Berliant on bass are the other members in Michael Thompson Band. Simply a nice album for melodic rock fans.